"Waise bhi kisi ne mujhse kaha tha har ishq cheez ka apna waqt hota hai. "( Someone once told me every love thing has its own time.) - from the movie Jab Tak Hai Jaan. I think today is a perfect time to let you guys know about my favorite brushes because, Sigma is having a free worldwide first class shipping 48 hour Annual Event, valid from 12:00AM US CST THRU NOV 22nd - 11:59PM US CST FRI NOV 23rd. I promise, I will try to do a detailed review on all the brushes I have. Lets not waste more time. 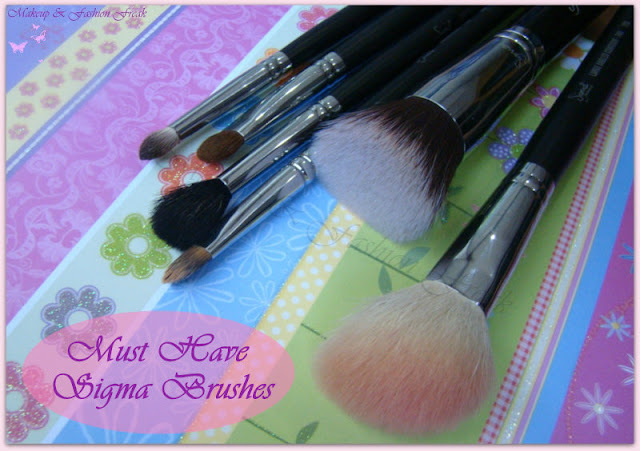 Following are the brushes I use on regular basis and cannot do without them a single day. I had received this brush few days ago (SEE HERE) and I am totally in love with it. It applies and blends foundation like a dream. Trust me this is a must have foundation brush. Again, this is a must have eyeshadow brush for the application of eyeshadow over the entire lid. Now this is a must, must have brush to conceal small areas like acne spots, around the nose etc. I use it every single day. I love to apply powder blush with this one and also to contour my cheekbone. I usually use it for blending my eye shadow all over and at the crease but when in hurry, I apply and blend eye shadows using only this brush and it gives good results. I use this little thing to do many things- to apply e/s on the crease, to soften pencil liners on the upper and lower lash line, to highlight the inner corner. This is it. I hope this helps you in adding stuffs to the cart and taking full advantage of the 'free shipping worldwide' offer.